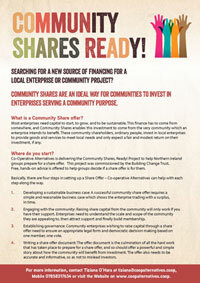 Community Shares are an ideal way for communities to invest in enterprises serving a community purpose. It’s all about people working together to create something new! Find out more by downloading our Community Shares leaflet! Buying a building for a new community hall. Energy projects such as wind or solar power. Build a stadium or renovate a leisure facility. The purchase of rural and urban shops, pubs and breweries. Buying a piece of land for agricultural collectives. Who can make a Community Share offer? To put forward this type of share offer, the group/enterprise will need to register as an Industrial & Provident Society such as a Community Benefit Society, and the enterprise must benefit a community in Northern Ireland. Find out more about Community Shares by contacting Tiziana O’Hara at Cooperative Alternatives at Unit 40a, North City Business Centre, 2 Duncairn Gardens, Belfast BT15 2GG. Email tiziana@cooperativealternatives.coop or phone 07858317634.